Most years, San Diego Comic-Con and Disney's D23 Expo are spread out over a few weeks, with SDCC happening in July and D23 often slated for August. This year is a bit different. D23 will actually happen in Anaheim this coming weekend, July 14 through July 16, with Comic-Con happening just a few days later, running from July 19 through July 23. Marvel Studios has already been confirmed to have a presence at boh conventions, but now we have confirmation that there will in fact be a Marvel D23 event that will reveal never-before-heard details about Avengers: Infinity War. MCU News and Tweets reports that there will be an Infinity War event on Saturday, July 15 at the D23 Expo, which will "unveil never-before-seen details!" about this highly-anticipated superhero movie. The news was revealed on the official D23 mobile app, although no details about the event's time and location made available. Perhaps there will be updates in the next few days as we get closer and closer to D23. If there are in fact details about Infinity War revealed at D23, it will be interesting to see if the movie has a presence at SDCC at all, or if they bring the exact same presentation to both events, giving Disney fans a look first. The Marvel Comic-Con panel has already been confirmed for Saturday, July 21 in Hall H, with the massive 90-minute panel lasting from 5:30 PM to 7:00 PM. It is believed that Avengers: Infinity War is close to wrapping up shooting, with a New York City shoot starting Monday July 10, although it isn't clear how long that shoot will last. It's possible that filming wraps just in time for San Diego Comic-Con, although it isn't know if shooting will be done before D23 starts this coming Friday. It also hasn't been confirmed who will be present from Avengers: Infinity War, but it seems likely that Marvel Studios president and Infinity War producer Kevin Feige will be on hand for both D23 and Comic-Con. Regardless, we'll find out for sure sooner rather than later. 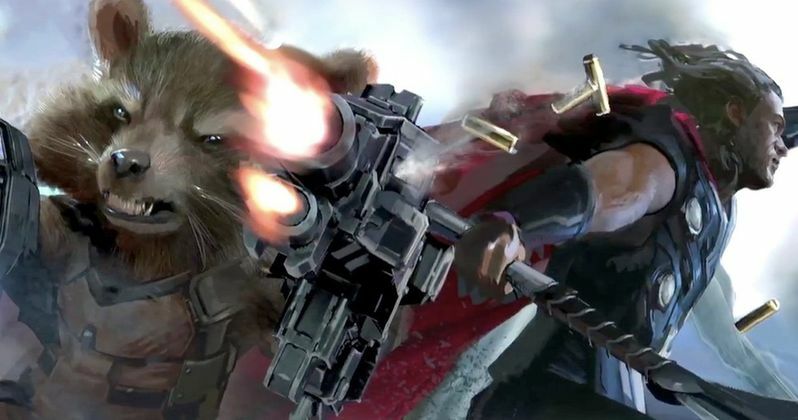 It's possible that Kevin Feige may even address a statement he made in an interview last month where he confirmed that Avengers: Infinity War will in fact kill off some of Marvel's heroes. With many of the original Avengers almost through with their Marvel contracts, there had been plenty of rumors that not all of Marvel's heroes will make it out alive, especially since they're dealing with the powerful villain Thanos (Josh Brolin). Still, it would seem unlikely that Kevin Feige would confirm which heroes die and which don't, but anything is possible at the Con, and D23. While no cast list has been confirmed yet, the Avengers: Infinity War will include Josh Brolin (Thanos), Chris Hemsworth (Thor), Sebastian Stan (Bucky/Winter Soldier), Scarlett Johansson (Natasha Romanoff/Black Widow), Jeremy Renner (Clint Barton/Hawkeye), Chris Evans (Captain America/Steve Rogers), Elizabeth Olsen (Wanda Maximoff/Scarlet Witch), Samuel L. Jackson (Nick Fury), Paul Rudd (Scott Lang/Ant-Man), Paul Bettany (Vision), Chadwick Boseman (T'Challa/Black Panther), Mark Ruffalo (Bruce Banner/Hulk) and Robert Downey Jr. (Tony Stark/Iron Man). It's possible that Marvel could confirm more cast members at either D23 or Comic-Con but that remains to be seen. Hopefully we'll have more on this highly-anticipated movie from both conventions over the next two weeks.